The vultures are circling – AMD has been struggling to compete with Intel on the CPU front and with Nvidia on the GPU front and profitability has been elusive. Naturally, acquisition rumors have cropped up, first Samsung and now Microsoft. Microsoft is a full-time hardware maker and it really needs chips – for its Xbox One console, for the Surface tablets, perhaps even for its Lumia phones. The info comes from KitGuru, which cites a source claiming Microsoft approached AMD a few months ago. 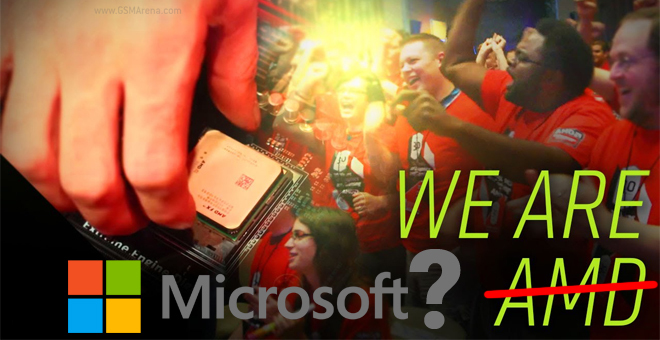 AMD provides the chipset (APU) for the Xbox One (and also the PS4) and allegedly charges Microsoft $100 per unit. Having already sold over 12 million consoles, that makes the total over $1.2 billion, close to AMD’s market cap of $1.8 billion. Microsoft is using Intel chips for the Surface tablets and Qualcomm chips for Lumia phones. Having an experienced in-house chip designers will allow the Redmond giant to build bespoke chips for the tablets. AMD doesn’t really have a presence on mobile, but recent rumors suggested that it may provide the GPU for MediaTek chipsets and Windows 10 will happily run on x86 processors from AMD. That is if the company can’t put together an ARM chip or just license Cortex designs like Samsung and even Qualcomm do. An added bonus of this potential acquisition is that Microsoft will leave console rival Sony out in the cold as far as next-gen PlayStation is concerned (or make a profit selling chips for it).